My teenage years were spent in Kingston-upon-Thames, where my father was minister of the Methodist Church in the town. I don’t often go back to Kingston; it’s a nice enough place to visit, but when we were living in North London it was a bit of a trek. Pleased with this photo, taken from one of the little bridges that crosses the stream that runs through the plantation. It’s actually a panoramic composite of 4 separate photos. It’s a long time since I’ve been to Kingston Methodist Church. The last time was my sister’s wedding and that was years ago. But a regular Sunday service – that was probably over 30 years ago. The church has changed – but not that much. It’s still identifiably the same place I attended as a teenager. There were even a few folk in the congregation who remembered me, including my Junior Church teacher Alan (who is still teaching Junior Church). The church is, apparently, doing well. It had been raining on our journey to Kingston; fortunately by the end of the church service it had started to brighten up. My parents suggested we go to Richmond Park for a bite of lunch at Pembroke Lodge and then a walk round Isabella Plantation. Now I am no stranger to Richmond Park – I cycled through it enough times when I was a boy – but I don’t remember ever visiting Isabella Plantation. Apparently it’s been recently tidied up, with paths improved, the ponds cleared and most of the rhododendrons – which as rhododendrons do, were threatening to take over the place – removed. 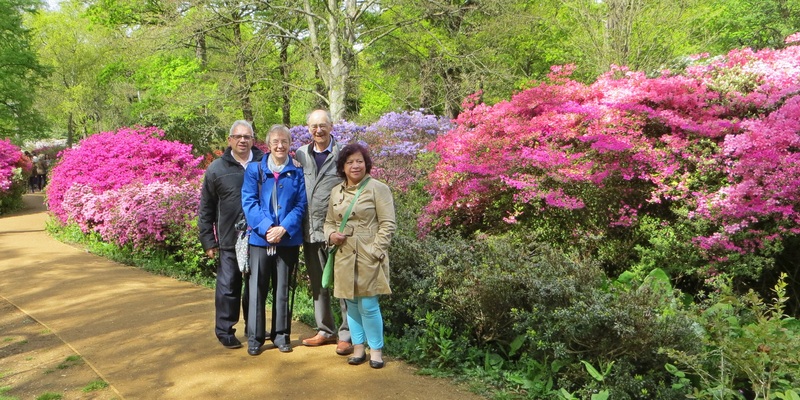 I have to say – I found Isabella Plantation absolutely stunning, with the azaleas, in a wide variety of reds, pinks and purples, brilliant in the sun that had now come out to shine. Mary Ann, who loves flowers, was in her element. “Well, God and the people who bred all those different varieties” I said. Want to see more photos? Here’s a link to a Facebook album here (you don’t have to be a Facebook member to see it). One of the distinctive features of Walworth Methodist Church, and one of the reasons for its growth, is the number of fellowships within the church community. Some of these cater for particular sectors within the congregation – men, women, young adults and so forth – and will be familiar to many churches. More unusual is the presence of four ‘national fellowships’ which are based on four of the largest ethnic/national communities within the church – Ghana, Sierra Leone, Nigeria and Zimbabwe. These meet at least monthly after the main church service, partly to offer informal worship, prayer and singing in various languages, but in particular to offer pastoral support to their members and raise funds to support projects ‘back home’. They are affiliated to the national fellowship bodies and serve as local branches of the same. No doubt in future blog posts I’ll say more about what the fellowships get up to. Each fellowship has an annual anniversary thanksgiving which is an opportunity to celebrate its own culture. On Sunday it was the turn of the Zimbabwe Fellowship to hold its anniversary. The Zimbabwe Fellowship is the smallest and most recently created of our national fellowships. 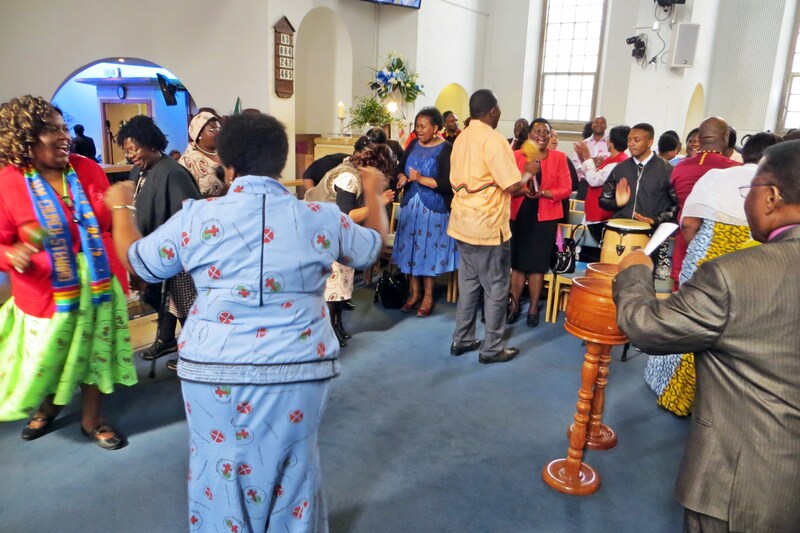 In fact it began as a gathering of Zimbabwean Methodists from around London and as we were told at the service Walworth is therefore regarded as the mother church for the MCZF-UK (Methodist Church in Zimbabwe Fellowship UK). Over the years various local branches were formed, some spun off from Walworth – there are now thirty around the UK – and the Walworth Zimbabweans, now a fairly small group, reconstituted as a local fellowship and branch of the MCZF-UK. In fact there seems to be some confusion as to how many years we were celebrating. In the worship service 11 years was mentioned, and on the programme we were told that it was the 7th anniversary service! It was a great occasion, and I hope a real encouragement for our Zimbabwe Fellowship – perhaps even a New Beginning. Being a dutiful son I popped into Walworth Post Office yesterday to post a package containing a Mothering Sunday present and card. I was pleasantly surprised to see that there was no queue; in fact I was the only customer in the post office. However there was a post office employee hovering by the counter, who when I approached her guided me over to a machine* that looked not unlike the self service checkout at the supermarket, and showed me what seemed to be the twenty or so steps that it takes to enter the correct information. (One screen even asks me to confirm that my package does not contain poisons or explosives.) It’s just as well she was there as the machine didn’t like the tatty £5 note I pushed into it, and it requested her assistance. After entering her security code hey presto, it printed off a stamp, I stuck it on the package and she kindly asked whether she could post it for me. As I thanked her for her assistance, she said “Next time you’ll know what to do.” “Use the counter?” I thought, but of course expressed it a little more politely. “I think I prefer dealing with a real person at the counter”. “Well, this is the way that post offices are changing,” she said, before asking me whether there was anything else she could help me with today, would I would like information about their credit card deal, and please could I enter their consumer survey on the post office website to report on my customer experience? I wonder whether they will let me suggest that I preferred the experience of a two minute transaction with a human being rather than five minutes wading through menus and options on a machine? You might think that after putting up with self service ticket machines at the Overground station and the automated check out at the supermarket, I would have breezed through my encounter with the post office stamp machine. The problem is that every machine is slightly different. I just about got the hang of the check out at the Tesco Metro near the church where I regularly look for reduced price offers for lunch, once I figured out that you don’t actually have to answer every question on the screen – just swipe the barcode and insert cash in the slot. But try using the machines in Asda or Sainsbury’s and I’m lost. In any case, once I have more than a half dozen items I find it quicker to queue and let a professional do the scanning. I quite begrudge having to do something myself which used to be done by the checkout assistant/Post Office counter clerk. Shouldn’t they be paying me for doing their work for them? If I was interested in their will-writing service I would have said so, wouldn’t I? Fortunately, a couple of days later, I have the opportunity to complain, after an email arrives noting that I recently visited the branch and was served by so-and-so and could I complete a brief customer survey about my experience? I answer that the service was great except for the tedious sales pitch afterwards. Needless to say, next time I’m in the branch, the conversation is the same, only this time it’s selling some sort of insurance. Considering that they have the technology to send out email telling me that the date and place I was in the branch, is it too much of a stretch to put a note on my account? “Do not try selling any products to this customer. He’s a grumpy old git.” Or something like that. *I just found out that officially this is a ‘Self Service Kiosk’. And according to http://www.postoffice.co.uk/post-go-in-branch “it’s the same reliable service, only quicker”. No it’s not! Like it or loathe it, harvest festival season is upon us. I have already written in a previous post about the wonderfully eccentric Revd Hawker, who is credited as the inventor of the harvest festival, or perhaps it would be better to say, the person who transformed the secular feast of harvest home into a church-based service of thanksgiving. The problem with harvest festival is that though it may still be a significant event for rural, farming communities, for city congregations remote from the production of food it is less meaningful. 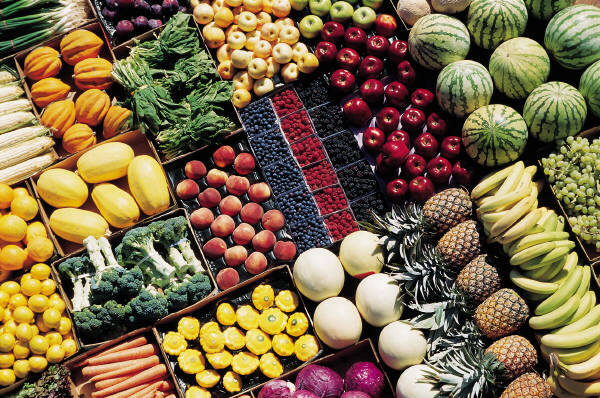 Of course, if not producers we all are consumers of food, and modern day harvest festivals often explore themes such as trade justice and ecological awareness. And, to my mind, if harvest festival can get urban congregations thinking about the rural economy for just one day a year, that’s not a bad thing. At Walworth it’s harvest festival this Sunday and it will be a fairly traditional service. However, being a predominantly African congregation means that harvest takes on a certain significance as a fund-raising event. After the worship there will be an auction of the harvest gifts and I would not be surprised if people bid crazy prices for ordinary fruit and vegetables. I’ll let you know how it goes. Which brings us to the Hymn of the Week. It’s one of the traditional harvest hymns which we will be singing on Sunday. I’m a bit surprised that it made the cut to Singing the Faith; we only really sing it once a year and there are plenty other, more useful, hymns that did not. It is also one of the hymns that escaped modernisation and has retained its full complements of thee/thy/thous – in fact as far as I can see it is unchanged from Hymns and Psalms. ‘To thee, O Lord, our hearts we raise’ was written in 1863, just twenty years after Hawker’s first harvest thanksgiving, which had become widely imitated. The previous year the Church of England had published an order of service for harvest festival. The writer was the prolific William Chatterton Dix (1837-1898), who contributed many hymns to Hymns Ancient & Modern (his other compositions include ‘As with gladness men of old’ and ‘Alleluia! Sing to Jesus’). The hymn begins with the harvest references in Psalm 65:9-13, but by a skilful series of transitions it moves in the second half of verse 2 to John 6:32-58, and thence to a vision of the last judgement as a harvest. In verse 3 there is a reference to Psalm 126:6: ‘he shall come again with joy, bringing his sheaves with him’. This psalm, which is about the return from captivity of the children of Israel, is then linked with another journey to Zion, the vision in verse 4. This is taken from Revelation 4:6-11. A quick note on the tune – Singing the Faith follows Hymns and Psalms in setting the tune to Arthur Sullivan’s tune BISHOPGARTH, which was written originally to accompany a hymn for Queen Victoria’s Diamond Jubilee in 1897. Curiously, over twenty years previously Sullivan had written a tune especially for this hymn, called GOLDEN SHEAVES. Although both tunes were included in the Methodist Hymn Book, the latter has all but disappeared from modern British Methodist worship. which never has an ending. Like many churches around the UK, today at Walworth we celebrated Racial Justice Sunday. Methodists have been observing Racial Justice Sunday on the second Sunday of September since 1989 and in 1995 it was recognised ecumenically. Walworth Methodist Church is connected with the development of my own awareness of issues around Racial Justice. Back in the late 80s I was a member of Lambeth Methodist Mission (now Lambeth Mission and St Mary’s) and we made a decision as a church council that we would collectively attend a racism awareness course organised by MELRAW (Methodist Leadership Racism Awareness Workshop), a programme founded by the remarkable Dame Sybil Phoenix. MELRAW was based at Walworth and Sybil worked closely with the then minister of the church Revd Vic Watson, himself a tireless worker and campaigner in the field of community relations. Of the contents of the workshop I now remember little but I do recall that it was challenging and eye-opening. The late 80s was a time for considerable reflection in the Methodist Church on the topic of race, firstly with the publication of the report ‘A Tree God Planted’ (1985), which was a call to Methodists to take seriously the issue of racial justice within the church and to work for greater representation of black and ethnic minority church members in the decision making processes of the church. In 1987 Methodist Conference affirmed its stand against racism and for racial justice. And, as already mentioned, a couple of years later churches were invited to engage with the issues by celebrating Racial Justice Sunday. of their own choosing in the light of grace. Well, that was an exciting, challenging and frequently confusing first week. What are my first impressions of Walworth Methodist Church? District chair Jenny Impey said, at some point in the week, that as soon as you begin to think you have started to understand what’s going on at Walworth, you then find you haven’t understood it at all. And she was right – I’ve already had a couple of conversations where I thought I had figured out a situation, then ten minutes later realised I hadn’t got it and was left trying to get my head round it. So far we’ve met some of the officers as they have called in to say hello and met with the leaders of Sunday School and the church stewards. As the minister’s office was being redecorated all week, David and I have been hanging around in the admin office, getting to know and getting in the way of the church admin staff, a team of three – Yolande (general admin), Hilton (property and IT) and Eunice (finance). Everything about Walworth is on a different scale to the churches I have pastored before. It’s pretty much the largest membership church in British Methodism – 500+ members and well on its way to 600, the majority African. The reasons for this growth, whether it is sustainable and whether it can be reproduced elsewhere is obviously something I want to explore. The Sunday School staff claim that they have 140 children on roll; there are 40 members in the choir (which is therefore larger than the Sunday attendance in three of the four churches in my last circuit). There are (if I remember correctly) twenty-something class leaders (pastoral visitors). The church owns extensive premises with various bits of it leased and rented, all of which needs to be managed. And then there is the extraordinary legacy of ‘Clubland’ – the ‘youth church’ pioneered by Revd Jimmy Butterworth in the mid 20th century. Quite a chunk of the past week was taken up with worship preparation. David and I had agreed some time ago that for this first Sunday we would lead both services together. Or more strictly speaking, I would lead the worship and he would preach. As there is very little overlap between the two congregations that meet at 9.30 and 11.00 this seemed the best use of our time as the same sermon could be repeated! I have to say that David preached an excellent and challenging sermon drawing on all three lectionary readings. Recalling a ‘wayside pulpit’ he had seen many years ago which mentioned the importance of ‘being nice’, David argued that Christians are not called to be ‘nice’; we are called to love – and that sometimes means having to make difficult and challenging decisions as we ‘speak the truth in love’. If this was the usual standard of his preaching I am going to have to raise my game! The first service is a fairly traditional service lasting about an hour. It is the second service that includes everything bar the kitchen sink, especially when it is a Communion service, as today. One of the highlights of the service is the ‘walk up’ offering, when the drums come out and the choir really gets the church moving. This really is worship as I most appreciate it: formal liturgy and extempore prayer; African choruses and traditional (and modern) hymns; silent prayer and joyful dancing – and never mind the fact that the worship lasted nearly two hours, because nobody’s in a rush to get home afterwards. After church there’s nearly always something going on: today it was meetings of the Ghanaian and Zimbabwean fellowships (David and I popped into both) and I travelled home on the bus with a number of the Ghanaians who were on their way to visit a sick member of the fellowship. That, that is the fullness; but this is the taste!